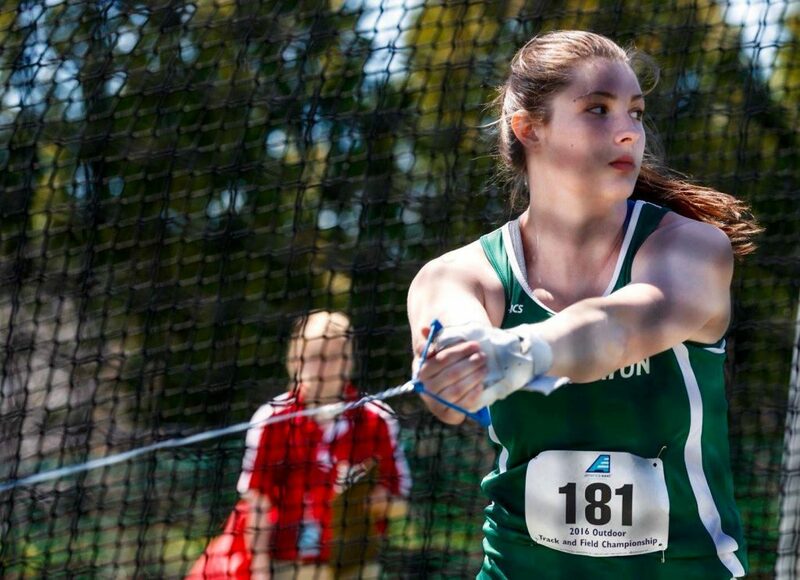 Provided by the Binghamton Athletic Department Graduate student Brooke Bonney placed first in the women’s weight throw, breaking her own school record in the process. This weekend’s frigid weather could not cool down graduate student Brooke Bonney’s record-breaking season as the Binghamton men’s and women’s track and field teams traveled to Boston University to compete in the David Hemery Valentine Invitational. In the women’s weight throw on Saturday, Bonney’s distance of 65-7 was good enough to place her first, with fellow graduate student Oyin Adewale coming in 10th (51-10.5). This is the third time in her career that Bonney broke the previous school record in this event. She previously set the record earlier this season on Dec. 8 at the Greg Page Relays with a distance of 64-8. In January, Bonney was named America East (AE) Women’s Field Athlete of the Week for the second time in her career. The first time she received this honor was Feb. 21, 2017. Like Bonney and Adewale, several Bearcats made their mark at the invitational this weekend despite the fact that athletes from a plethora of schools participated. Juniors Janelle Williams and Elly Scherer proved to be tough competition for other athletes. In the 60 meter dash, Williams’ time of 7.98 was good for second place, only .01 seconds from tying Saint Rose freshman Shania Mohammed for first. Williams also finished in the top 65 of the 200-meter dash (25.87). In the 60 hurdles invitational section, Scherer finished in fourth place with a time of 8.84. “In a big meet like this, it was a pretty big performance,” she said. On the men’s side, juniors Greg Matzelle and Jack Fitzgerald were two of the top performers this weekend. Matzelle placed second in the 60 invitational (6.90) whereas Fitzgerald’s 6-6 ¾ leap landed him in a fourth-place tie in the high jump. Senior Peter Mastracco and junior Matt Baker also turned in strong showings in their respective events. Mastracco finished in sixth place in the weight throw (55-5) and Baker’s triple jump distance (47-5) earned him eighth place. Senior Thomas Cooper registered a time of 48.87 in the 400 dash, which was the 19th best time out of almost 200. Cooper is currently enjoying a breakthrough in his third season for the Bearcats. With the AE Championships approaching, Thompson said both the men’s and women’s teams will look to improve on this weekend’s overall results. In preparation for the championships, Thompson said practices will still have a high level of intensity, but the volume will be less than practices earlier in the season. However, Binghamton can’t look that far ahead in the future just yet. Next up for the Bearcats is the Marc Deneault Invitational, hosted at Cornell’s Barton Hall in Ithaca, New York at 10 a.m. on Saturday, Feb. 16.